Unfortunately, this dive would put one of these divers in the emergency room. What went wrong? Chris didn’t tell Nick that his gear was in storage for over a year and that he hadn’t dove in as much time. Chris was overconfident in his diving skills and decided not to take a refresher course. As an Open Water diver, Nick was limited to 60 feet (18.3 meters) so the two divers planned to not exceed that depth. However, after 25 minutes at depth, Chris’ inflator valve stuck open and he began a rapid ascent to the surface. Now in a full panic, Chris held his breath the whole way up and was consequentially treated for pulmonary barotrauma at the local hospital. Nick was angry that Chris failed to tell him about his diving history and lack of equipment maintenance (in this case, a rusted inflator mechanism that was easily replaced). Nick felt that if Chris had shared more information, he would have considered finding a different buddy and diving with Chris once he had gone through a refresher course and had his gear inspected. It is without doubt that there are things that Chris should have done better, but what if Nick was equipped with a way to determine if his new buddy was safe to dive with? In our Open Water class we are taught how to assess the water conditions, plan a dive, conduct a pre-dive buddy check, how to communicate with each other under water and practice out of air situations but we’re never taught how to find a safe buddy. We are encouraged to exchange numbers with people in our class and dive with them, but that’s not always realistic if you have different diving plans than they do (for example, they are vacation divers and you want to dive locally). Sometimes newly certified divers are left looking for buddies to dive with and so join dive groups where those needs are met. Seasoned divers can wind up in a situation where a new diver asks to join them or where, for various reasons, they are buddied up with a stranger on a dive boat. We are not taught how to assess a potential dive buddy and ensure our (and their) safety before jumping into the water with them. What if you instead asked qualifying questions that enabled you to determine if you want to dive with this person or not? 1. What is your diving experience (number of dives and certification level)? Determines if this is a newer or infrequent diver who may need some encouragement. Are you comfortable with their certification level and potential depth limits? 2. How many dives do you have in this location and in these conditions? 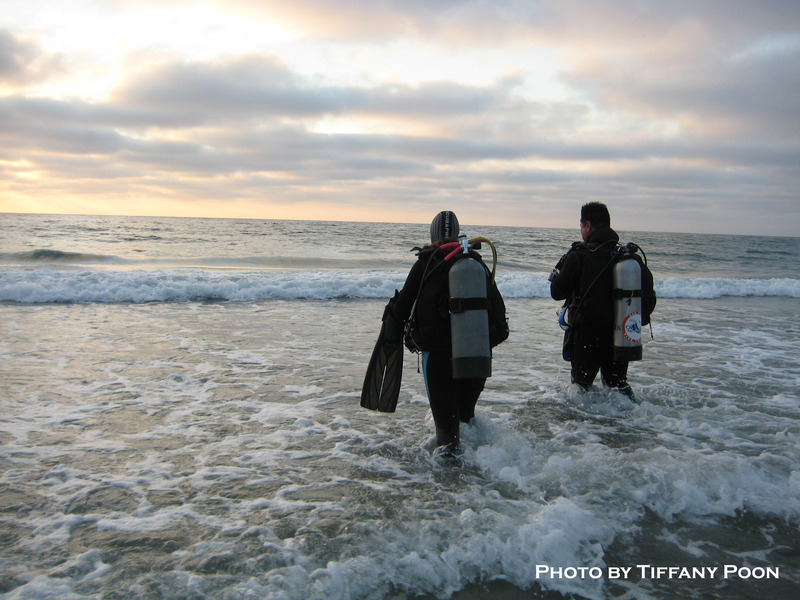 Our certification qualifies us to dive in conditions similar to what we were trained in. Can this diver handle getting through the surf, maintain composure in low visibility or conduct a night dive in an unfamiliar environment? 3. When was the last time you dove? Don’t be deceived. Just because someone tells you that they have 400 dives doesn’t mean that they have been in the water recently. Are you comfortable risking safety to dive with someone who may not remember how to assist you if you need help or who may panic when their mask floods? 4. How is your gear working and do you have it serviced regularly? Determines if they care about their safety in the water and ensures you have a reliable air source in an out of air emergency. How do you know if they have the skills to handle an equipment failure? If they dove recently, did they encounter any gear problems? 5. How long are your dives and what is your average depth? This is a quick way to help determine who may be the first to run out of air. Are they using steel or aluminum tanks and what is their capacity? It would be inappropriate to ask people about their medical or physical conditions, but you should use your own best judgment to determine if you want to dive with someone who appears to have obvious signs of impairment that you are uncomfortable with. For example, I’ve heard of people who reeked of alcohol insisting they were fit to dive. That’s definitely not someone anyone should want to dive with! You can tailor questions to fellow divers to suit your needs. For instance, if you are a wreck diver, your questions would be changed to satisfy the skills needed on a dive to penetrate a ship. The idea is to encourage you to ask questions to benefit the safety of you and your buddy. Keep in mind that if you are asking questions and don’t feel like the other person is being honest with you, follow your gut instinct. If you find out that they weren’t being honest (maybe after something goes wrong) then at least you did your part in attempting to ensure your (and the other diver’s) safety. If you feel uncomfortable asking divers questions about their skills and level of diving consider what the consequences are if you don’t. I’d rather tell a diver, “No, I don’t feel comfortable diving with you until you have your gear serviced or take a refresher course,” than face a family who is mourning the loss of their loved one because of a gear malfunction that contributed their death. Also, consider that as you ask another diver questions about their skills and comfort levels, you too may want to volunteer the same information to them. If you are a new diver looking to dive with others, ask questions and reciprocate with honesty about your skill level as well. Know that divers may feel hesitant to dive with you, so be candid about your weaknesses and point out your strengths. This tells them that, in the least, you have an understanding of what you’re doing in and out of the water as a newly certified diver. Of course, there are some divers that are okay jumping in the water with just anyone and that’s fine if he or she is comfortable with the risks. However, there are plenty of divers out there that have scary buddy stories to tell or who may have had a better experience if they had taken steps to find out a little more about their new dive buddy. Of course, asking questions doesn’t mean that it’s ultimately going to eliminate any dangers. We all know that anyone, no matter his or her skill level, can have a bad day in the water, even leading to loss of life. Unexpected things do happen. However, by putting information out on the table from the start increases your chances of having a great day in the water. It can help determine a safer dive plan, lead to improved buddy alertness, boost skill confidence, enhance safety awareness, and most importantly build a foundation of trust with a potential lifelong diving friend. The above story is based on true events. Names and details have been changed to protect privacy. Proud to call you my dive buddy 🙂 Great article and well written. Cheers!